Do You Know How to Stress Words in American English? Susan, which words should I stress when I speak American English? After a few coaching sessions, my clients begin to understand that Americans don’t stress every word in a sentence. American English speakers stress (or emphasize) the most important words in a sentence or phrase. If you want to speak with increased clarity, you should do that too. American English speakers reduce the sounds of smaller words. Little words like the ones below are usually reduced. Pronunciation textbooks often use the terms Focus words, Content words & Function words when referring to word stress. I often say that the important words are like waves in the ocean. You need to rise up on each one by using more pitch. 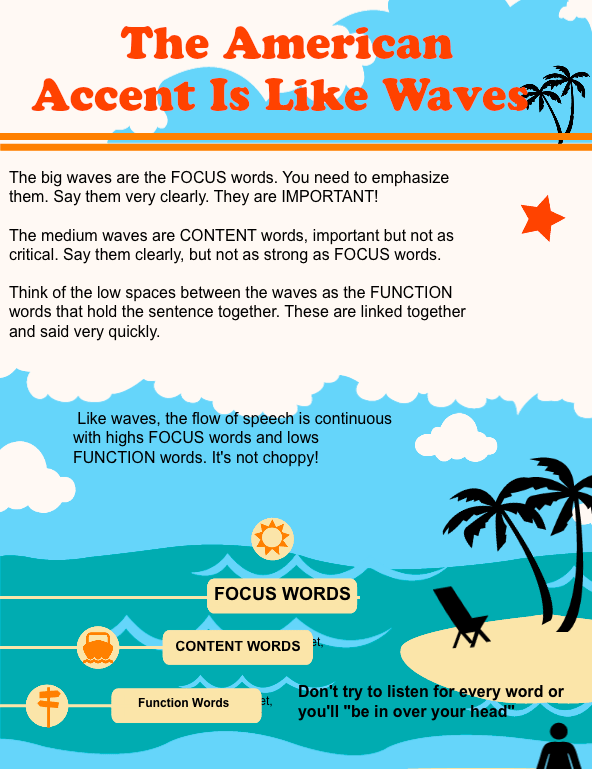 The most important word (or focus word) is like a slightly bigger wave. You need to rise up on that word just a bit more. My iBook is easy to use. That’s because all of the audio and video lessons are built right into the book. There are lots of practice exercises too! If you are an iPad user, working to improve the way you speak American English, take a look at the details here ☛ American Accent iBook.